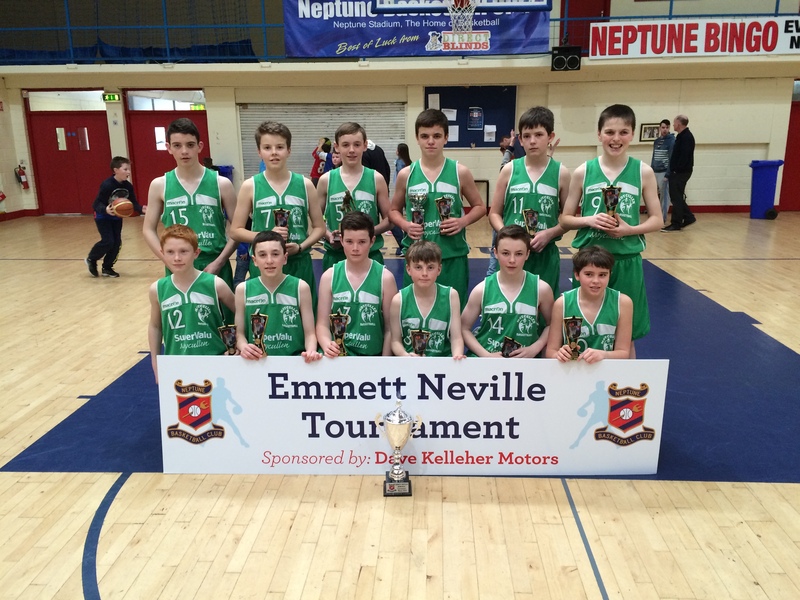 Moycullen U14 Boys continued their great season winning the Emmet Neville tournament overcoming the home team 68-34 in Neptune stadium at the weekend. The boys were placed in a strong group which included Befast Star, Blue Demons, Limerick Celtics & Kerry Green and played consistently throughout the day recording four wins. The last game of the day at 3:40 against Star was to decide the group as both teams had recorded three wins up to that point. The lads’ only previous encounter with star had ended in defeat in a Liffey Celtics tournament at the start of the season. Defence proved key in the game as the lads restricted Star to 28 points, scoring 37 themselves to record a satisfying victory and head to the semis as the group winners. Moycullen played Kerry Blue in the semi-final at 11am on Sunday morning while Star played Neptune on the adjoining court. Both games went down to the wire. Playing 7 minutes a quarter with a stopped clock, both games were in the balance as simultaneously, time outs were called with 4 & 10 seconds on the clock with all 4 team still in with a chance of the final. Moycullen had a torrid first quarter trying to deal with a big Kerry forward who was proving unstoppable and trailed by 10 after the first quarter. The lads got it back to a two point game by half time and it was nip & tuck from there to the end. With a two point lead going into the final 30 seconds, Moycullen played great defence to force a turnover. Iarlaith O’Sullivan displayed great composure as he made both free throws after being fouled with 4 seconds remaining. The team displayed tremendous grit throughout this game and the manner in which they fought, competed and closed it out will stand to them later. The final against Neptune – who came through against Star by a point – never materialised into the game expected. Moycullen started like a house on fire with James Connaire & James Cummins scoring 8 points each in the first quarter to carve out an 18-6 lead. The second quarter five was equally dominant and the game was over as a contest by half time. Iarlaith O’Sullivan had his record score in a Moycullen shirt topping the scoring charts with 19, James Connaire & Paul Kelly weighed in with 14 each and James Cummins had 10. Paul Kelly took the MVP award and Moycullen took the trophy. This was ultimately a triumph for the team however as all 12 figured on the score-sheet at some stage over the weekend & everyone contributed by making all those unseen, less visible efforts, boxing out, rebounding, covering and assisting when called on. The team go on this week to play Titans in the Galway league final & then to Neptune again in April for the AICCs.